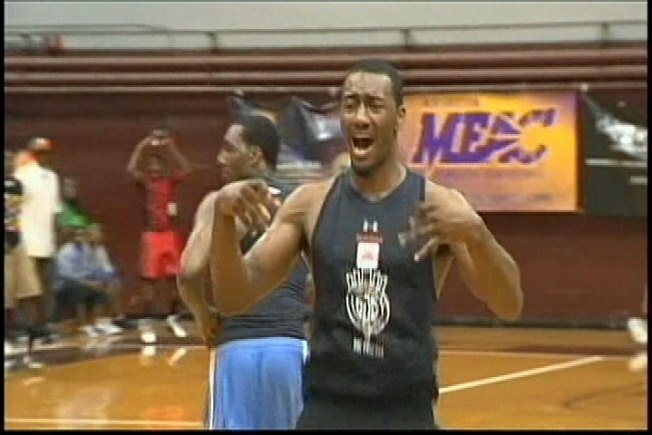 John Wall Shows Off in N.C.
John Wall has been spending his summer playing as much basketball as he can. On Tuesday, he took his talents to North Carolina for the Greater NC Pro-Am. Started by former Wizard Jerry Stackhouse, the Pro-Am brings together professional athletes, collegiate players and local high school all-stars for a who’s who of summer league basketball. All of that showboating wasn’t enough to take down the Wizards guard, as Wall sunk a game winner to give his team the 73-71 victory. Wall, who refuses to be slowed down by the lockout, will head to Los Angeles for the ESPY Awards on Wednesday and mentioned that he’d be playing in a summer league on the West Coast, as well.